Google 'mean reversion,' I dare you. You'll get everything from the most complicated academic mathematical studies to people claiming it's hocus pocus to those who swear it's the holy grail of investing. So, just what is 'mean reversion'? Wikipedia defines it as "the assumption that a stock's price will tend to move to the average price over time." But do you want an even simpler, more real-life example? OK, say a stock is at $20, bad news comes out, and it goes to $10 over a few days. Is there an opportunity to buy it at $10, sell it at $15, and reap a 50% gain? We think so. Let's start at the top. The market overreacts to everything. If the news is bad, investors see the stock going to zero. If its good news, they see the stock going to $10,000. And it isn't just concentrated to individual equities. On September 29, 2008, the S&P 500 lost 106.85 points. That's a single day drop of 8.81%. Two weeks later, on October 13, it bounced back with a 104.13-point gain, or 11.58%. If that wasn't enough of a recovery for you, the S&P 500 added another 91 points, or 10.79%, on October 28. Does everyone remember the technology bubble of 2000? Well, it reached a crescendo on March 16, 2000, with a 66-point gain, still the third highest daily gain in the last 50 years on the S&P 500. This was followed up by an 84-point decline on April 14, the third largest decline in the last 50 years. Both moves happened all within one month. Over the last two months, in our monthly white papers we have tried our best to debunk investing. For investing is not that complicated—human emotions are. In June, we wrote about "Time in the Market, Not Market Timing", which emphasized that, if you have a plan and are patient and disciplined in your approach to investing, then money is virtually assured to be made. Was there a difference between investing on the best day of the year and the worst? Sure. Was it enough for someone to regret their decision? No way. The results were 8.82% vs 6.58% over 20 years. If you look at 10-year rolling periods in the S&P 500, there are 80 points to review, and 75 of those 80 resulted in positive returns if you had a 10-year time horizon. Those numbers dropped to 65 positive and 24 negative periods if your time horizon was one year. In July, we examined investor behavior and an investor's virtually perfect penance if acting on their own for selling at the low and locking in a loss. We highlighted that the average mutual fund in a 10-year period had a 9% return while investors in those funds had returns of less than 3%, that fear was greater than greed, and that nearly every investor feels that zero is in play when things turn south. This month, we are discussing the finer points of investing and looking at where "select, measured" opportunities could be taken advantage of from either an individual equity standpoint, or even a sector play, based on mean reversion.. The above chart shows the performance results of 12 sectors within the S&P 500. Energy was the worstperforming sector in 2014 and 2015, and then the best in 2016. Real estate went from third to last to first in 2012, 2013 and 2014. Health Care had a good run: second, third, and second again in 2013, 2014 and 2015, and then last in 2016, and it's #1 YTD in 2017 (as of July 6, 2017). At WT Wealth Management, we believe this epitomizes mean reversion. Do we pick sectors based on this? Sometimes. It's simply one of the dozen or so tools we use to try to place our investors in areas we believe have the best chance of success with, in our opinion, as little downside as possible. In short, nothing stays up or down forever. Often the biggest loser one year is the biggest winner the next, and the biggest winner frequently becomes the biggest loser. That's the essence of mean reversion. A 5-, 10- or 15- year chart makes it look like a smooth ride, but in reality it never is. Unforced errors and missed opportunities present themselves every day. This harkens back to our incessant talk of having a plan and knowing your risk tolerance and real objectives. The same opportunities present themselves in the individual equity world almost daily, and especially around earnings season. In our more aggressive accounts, where investors want speculation, we use a strategy of buying when "blood is in the streets". Not a game for the faint of heart, mean reversion requires knowledge, discipline and patience. Consider Palo Alto Networks. (The chart is below.) Tech companies like Palo Alto trade based significantly on earnings and earnings guidance. They also trade at high price to earnings (PE), which make them even more volatile. Earlier this year it had one of those instances and fell from the $150/$155 range to $115 in a few trading days. Then, by June, good news surfaced, and the stock rallied back to the mid $130's. Does it always work like this? Heck no. It could take you months or years to capture your return. Again, as I stated earlier, mean reversion is one of a dozen tools we use for trading individual equities. In this case, we did buy Palo Alto under $112 and sold half our position above $135, a nifty 20% gain on that trade. It should be no secret—investors, speculators and trades overdo everything. Nothing is as bad or as good as we all would be led to believe. Mean reversion is a real tool on both the upside and the downside. It's one reason why we at WT Wealth Management constantly fade winners by selling and taking profits. It's also a reason why we may be buying stocks on a day when people question our sanity. Human nature is funny. Many people would feel better buying a stock that had gone from $10 to $20, than from $20 to $10. Read that last sentence over and over again. It's human nature at its best—or maybe its worst. Graham, B. (2017). 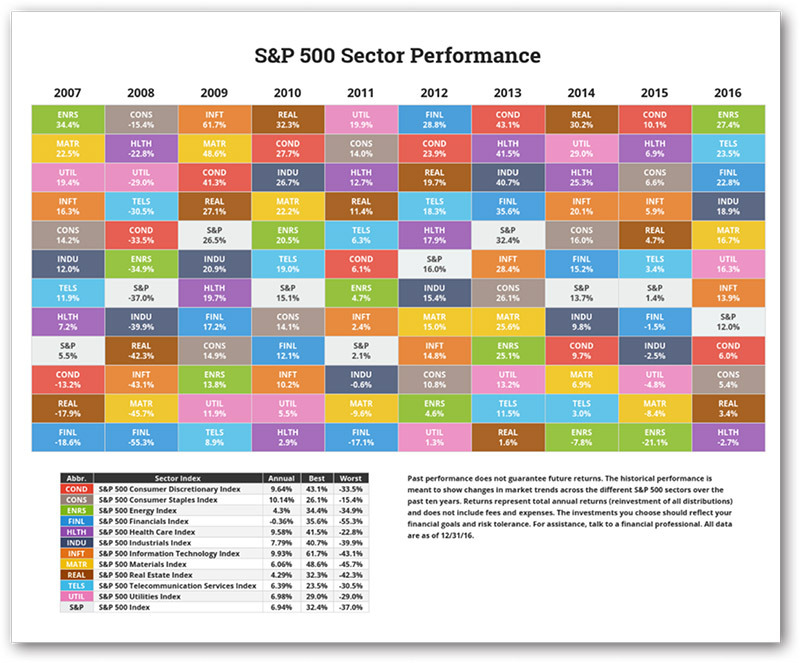 Annual S&P sector performance. Novel Investor. Heilner, J. (2017). Most investors acting on their own fail to capture market returns. 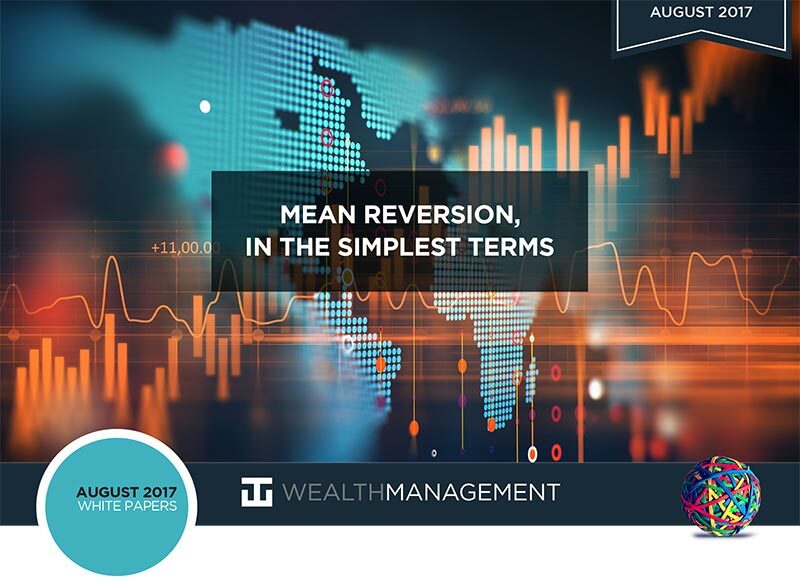 WT Wealth Management July 2017 White Papers. Manuel, D. (2017). S&P 500 historical data. DaveManuel.com. Nasdaq. (2017). 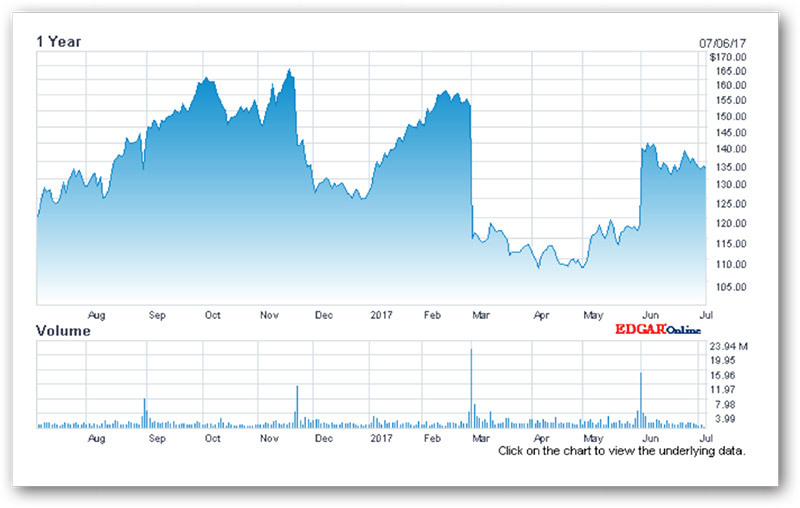 Palo Alto Networks, Inc., stock chart. Nasdaq.com. Overstreet, T. (2016). Using binary options to trade mean reversion in the stock market. Nadex: All About the Binaries. Shell, M. (2017). Regression toward the mean (mean reversion). ASYMMETRY® Observations. Wikipedia. (2016). Mean reversion (finance). Wikipedia, The Free Encyclopedia. WT Wealth Management is a manager of Separately Managed Accounts (SMA). Past performance is no indication of future performance. With SMA’s, performance can vary widely from investor to investor as each portfolio is individually constructed and allocation weightings are determined based on economic and market conditions the day the funds are invested. In a SMA you own individual ETFs and as managers we have the freedom and flexibility to tailor the portfolio to address your personal risk tolerance and investment objectives – thus making your account “separate” and distinct from all others we potentially managed. WT Wealth Management is a registered investment adviser in Arizona, California, Nevada, New York and Washington with offices in Scottsdale, AZ Jackson, WY and Las Vegas, NV. WT Wealth Management may only transact business in those states in which it is registered, or qualifies for an exemption or exclusion from registration requirements. Individualized responses to persons that involve either the effecting of transaction in securities, or the rendering of personalized investment advice for compensation, will not be made without registration or exemption. WT Wealth Managements web site is limited to the dissemination of general information pertaining to its advisory services, together with access to additional investment-related information, publications, and links. Accordingly, the publication of WT Wealth Management web site on the Internet should not be construed by any consumer and/or prospective client as WT Wealth Management solicitation to effect, or attempt to effect transactions in securities, or the rendering of personalized investment advice for compensation, over the Internet. Any subsequent, direct communication by WT Wealth Management with a prospective client shall be conducted by a representative that is either registered or qualifies for an exemption or exclusion from registration in the state where the prospective client resides. For information pertaining to the registration status of WT Wealth Management, please contact the state securities regulators for those states in which WT Wealth Management maintains a registration filing. A copy of WT Wealth Management’s current written disclosure statement discussing WT Wealth Management’s business operations, services, and fees is available at the SEC’s investment adviser public information website – www.adviserinfo.sec.gov or from WT Wealth Management upon written request. WT Wealth Management does not make any representations or warranties as to the accuracy, timeliness, suitability, completeness, or relevance of any information prepared by any unaffiliated third party, whether linked to WT Wealth Management’s web site or incorporated herein, and takes no responsibility therefor. All such information is provided solely for convenience purposes only and all users thereof should be guided accordingly.